The 1/2 Krugerrand is one of the most popular Krugerrand coins on the planet and is also considered one of the most reliable investments. 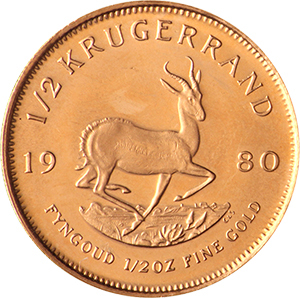 The Krugerrand itself has remained the most popular gold bullion coin since its introduction in the 1960’s. By the early 1980’s, the Krugerrand made for more than 90% of the entirety of the global market in gold bullion coins. Although production dropped in post-Apartheid South Africa, it has increased significantly in recent years. The 1/2 Krugerrand is of 22 carat purity (91.67%), among the very highest in the world, and has a gold weight of 16.965g. It’s diameter measures 27.07mm and thickness 2.215mm. The non-gold parts of the coin are made of “Crowned gold”, essentially copper, and is also used for British Gold Sovereigns. The main advantage for cooper coins is they are hardier and far less likely to mark than their silver equivalents. 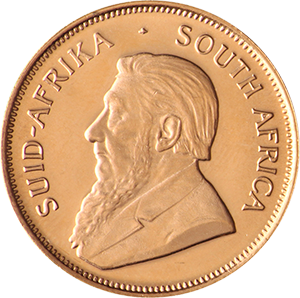 The Krugerrand’s design typically shows the image of Paul Kruger, the South African Prime Minister of the 19th century, on the obverse of the coin and the ubiquitous Springbok on the inverse. This simple design, in its various guises, has been the hallmark of the coin for its 50 year history and is thought to be the most iconic of all gold bullion coins. The success of the Krugerrand, in the 1970’s in particular, led to other government mints seeking to cash in on the “Bull market”. This influenced the production of the Canadian Maple Leaf (1979), the British Britannia (1987), the American Eagle (1986), Chinese Panda (1982) and the Australian Nugget (1981). In essence, the Krugerrand has informed gold bullion markets beyond its humble beginnings in 1967, often outselling domestic coins in their own countries many times over.